The European Commission wants pharma to make clinical trial results more patient-friendly. Its proposed guidelines are available for public comment until 31 August. Georgina Collett and Joanna Russell outline the benefits for pharma and patients. An area that is surprisingly late to the table, though, is the cornerstone of medical research, the clinical trial. It seems pretty obvious that patients, and the general public, should be able to access and understand clinical trial results, and there have been increasing demands for these to be provided in a patient-friendly format. A previous article discussed how the European Commission was working towards making it a requirement for pharma companies to provide lay summaries of clinical trial data. These summaries will be made available on the EU portal and database, currently in development. 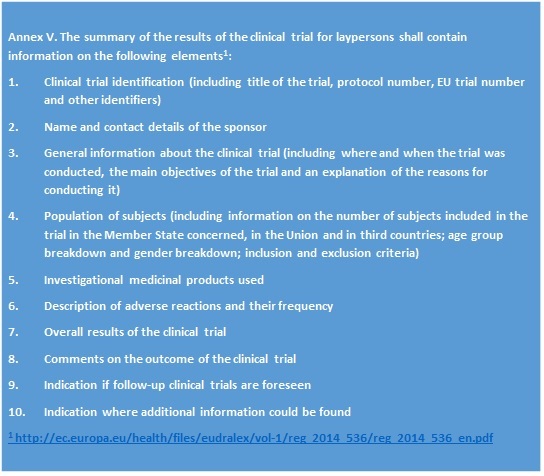 Since the article was published, guidelines for the new EU clinical trial lay summaries have been released for public consultation (1 June-31 August). These have been developed in preparation for the implementation of the Clinical Trials Regulation (EU) No. 536/2014 by an expert group involving representatives from pharma, patient organisations and academia. 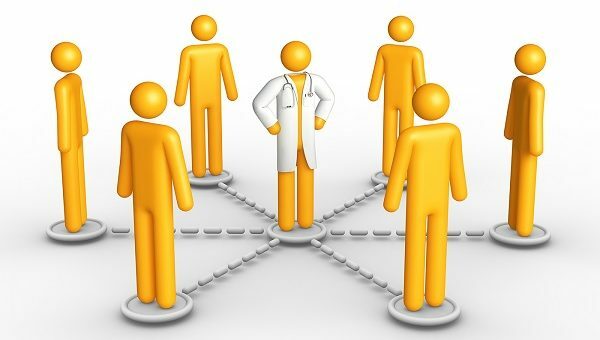 The ultimate goal of any lay summary should be to communicate complex data and scientific concepts in a patient-friendly manner, by using simple, everyday language. The draft recommendations aim to encourage consistency in the way the new clinical summaries are presented, improving awareness and understanding among patients, trial participants and the wider public. The guidelines emphasise the need to include information on the 10 elements stated in Annex V of the regulation (Figure 1). However, if appropriate, the order of the headings can be altered, categories combined, and sub-headings added. Detailed recommendations on the information that should be included for each element are provided with some suggested wording; examples of neutral, non-promotional language are also provided in Annex 2 of the guidance document. Clinical trial lay summaries represent an opportunity for pharma to demonstrate real, practical ‘patient-centric’ activity, as well as helping to build public trust and enhance support for future clinical research. Although clinical trial lay summaries are not yet mandatory, they are considered best practice for patient-centricity. So why aren’t more pharma companies developing them now, and harnessing the opportunity to lead and provide real value to patients? Decisions can be made at a company-wide level or at the franchise level, as long as the approach is consistent. There are many ways in which companies are already adapting their operations.2 These differentiate them among external stakeholders and provide a benchmark for others to follow. The draft recommendations address some of the key questions raised about Annex V of the Clinical Trials Regulation during the European Forum for Good Clinical Practice (EFGCP) workshop in May 2015. However, a number of important questions remain for pharma companies (Figure 2). 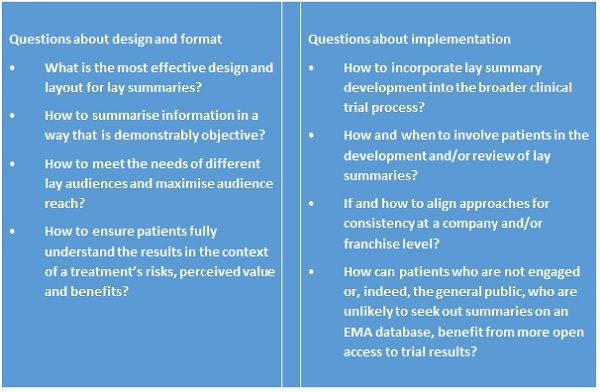 Despite these outstanding questions, the guidelines are a good starting point from which to shape best practice in delivering clear, understandable information to trial participants, patients, patients’ families and the wider public. Pharma companies are already planning for success and lay summaries will begin to achieve their full value as they become standard practice. The cultural change towards a real partnership with patients is challenging, but essential if companies want to demonstrate genuine commitment to improving the lives of patients. This change is exciting and engaging – and any company that takes the lead now will be in a unique position to establish the benchmark for best practice. If you have any questions on the new clinical trial guidelines, or would like to discuss any of the topics mentioned in further detail, please contact Jo Fearnhead-Wymbs, Patient Engagement Director at Ashfield Healthcare Communications (J.Fearnhead-Wymbs@ashfieldhealthcare.com). Georgina Collett is a Senior Medical Writer at iMed Comms and Joanna Russell is an Account Manager at Watermeadow Medical. Both are part of the multidisciplinary team of patient experts at Ashfield Healthcare Communications, part of UDG Healthcare plc. They can be contacted via Georgina.Collett@imedcomms.com and Joanna.Russell@watermeadow.com.